Candida PRO by PROsymbiotics helps maintain normal candida albicans balance and provides immune support. Candida PRO™ has Bifidobacterium to promote GI tract health by feeding on Candida albicans and Lactoferrin that robs Candida of iron needed for growth. Candida PRO supports overall immune health by adding extra levels of lgG and PRP's, Colostrum's most important component that you can't get from any other kind of supplement. 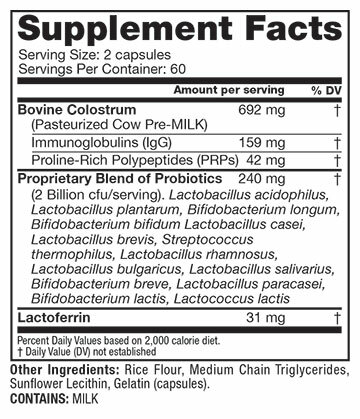 Research has shown colostrum to help stimulate new cell growth of intestinal villi height by greater than 20%. Quality and Purity Assured. PROSymbiotics Colostrum with Immulox, exclusively from USDA Grade A dairies and only from first milking. Laboratory tested and verified free from pesticides, antibiotics and rBHT hormones. Each bottle is double sealed for quality and safety. If either seal is broken or missing, do not use and call 1-800-421-1830. Close tightly and store in a cool, dry place (below 75ºF), away from heat. Warning: If you have a physician-diagnosed health condition, consult your doctor before taking this product. Discontinue use if you experience adverse reactions and consult your doctor. *THESE STATEMENTS HAVE NOT BEEN EVALUATED BY THE FOOD AND DRUG ADMINISTRATION. THIS PRODUCT IS NOT INTENDED TO DIAGNOSE, TREAT, CURE OR PREVENT ANY DISEASE. Take 2 capsules, twice daily, with water or your drink of choice, on an empty stomach. Take up to two additional servings per day in times of environmental or physical stress.